This past May, Jace Clayton, aka DJ/rupture, released his Sufi Plug Ins suite—a set of software tools for Ableton Live that promote non-Western notions of poetry and musical improvisation. Using Arabic scales and polyrhythms, the plug-ins not only expose Western cultural bias in music technology, but also larger assumptions about Western cultural dominance—“social software”, as Clayton calls it in conversation with A.J. Samuels. Currently only available for Ableton Live, the Sufi Plug In suite will soon be out as VSTs. Sufi mysticism as musical practice— and free download. What are some of the Western musical assumptions in European and American- made plug-ins that you wanted to provide alternatives to? of Western software you open up is set in 4/4, the standard pop rhythm. Often you can adjust the rhythms to 6/7 or 6/8 or whatever, but overall, the software doesn’t work well with polyrhythms, which are extremely common in so many different types of non-Western music. The same goes for the default tuning system, which is a major scale—like a C Major scale, as if your MIDI keyboard had 88 keys. With my group Nettle, we have all these songs we play that are in Arabic tuning, so the first thing we did was create four different software synthesizers, each one capable of selecting between four different Arabic “maqams” or scales. They only play these scales, so you wouldn’t be able to use them to play, say, a D Minor scale. “Middle Eastern” editions of the Korg PA500 and VST plug-ins with non-Western drum modules and microtuned oud and baglama interfaces do exist. Did you check out Arab and Middle Eastern electronic music interfaces before you decided to design your own? Actually, no, not at all. Part of the design process included research, but the other major part was brainstorming with Nettle about specific needs. Ever since working with Moroccan violinist Abdelhak Rahal in Barcelona seven or eight years ago, I’d always wanted the software to be able to do certain things—to work better with Moroccan musical ideas. But as the Sufi Plug Ins idea took shape, it increasingly existed in this space between art and tool. 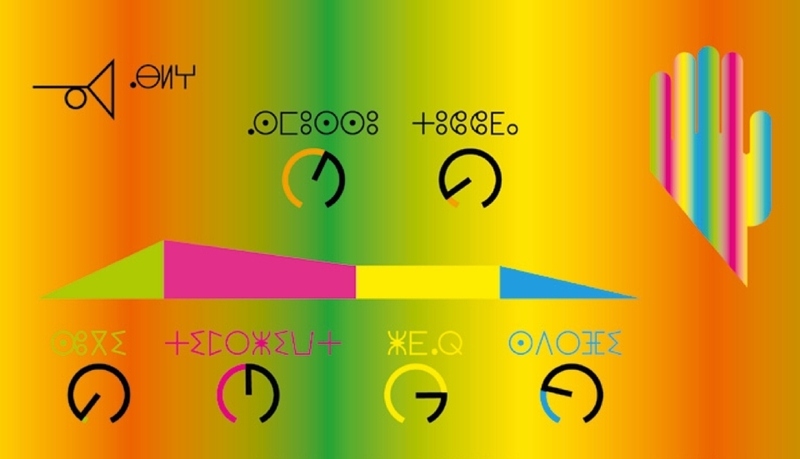 All of the terms of synthesis—oscillator, low pass filter, volume, pitch—are translated into the Berber language of Tamazight and written in the Berber script of neo-Tifinagh. Also, for the roll-over texts, we put in fragments of Sufi poetry chosen in conjunction with how the knobs or buttons work. When you open up the plug-ins you see very few Roman characters. The idea is to encourage people to think more with their ears. And with all the bits of poetry flying around, hopefully that will seep into the process, too. Certainly at the more conceptual end of the plug-in suite is Devotion, which only works with silence. Five times a day, during the call to prayer, it’ll lower the volume of your computer depending on the level of “devotion” you choose from the presets: agnostic, apostate, observant, fervent or devout. Atheism is not a choice. That indeed sounds more like conceptual art. Actually, I had been staying with a friend of mine in Morocco—an amazing composer and banjo player named Hassan Wargui—whose father, Abdellah Wargui is a muezzin and is against all forms of music for religious reasons. He actually won’t listen to his son’s music. It’s ironic because Abdellah actually has a really beautiful voice. I wanted to design something to respond to that situation. Also, I was interested in flipping the idea of aiming for the widest possible audience that’s designed into in a lot of software. Is the everyday Islamic focus of Sufi Plug Ins and its reminder of Western musical chauvinism a critique of Western political chauvinism?